Earth's International Space Station has awoken their first humanoid Robonaut from his deep space sleep. Isn't that cool? But who or what is R2? 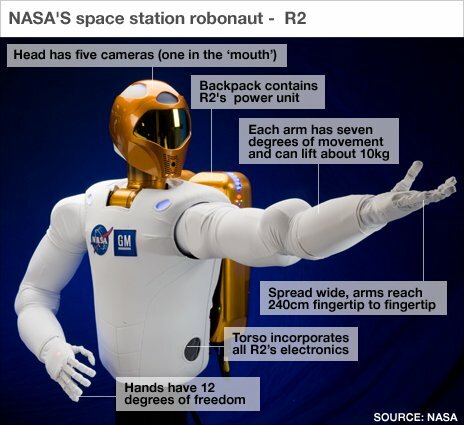 I guess Robonaut 2 could be a distant relative of Star Trek's Mr Data who's definitely more than just a machine. While neither of these droids eat, sleep, drink or feel pain, their human-like features and capabilities are a source of great inspiration to us mere mortals. R2's full name is Robonaut 2 Unit B to be precise but like Data he's got tons of personality despite having no emotions! Strange but true. NASA's white tinman doesn't even talk but since February, R2's already got an enthusiastic 47,000 followers just by tweeting on Twitter! "Those electrons feel GOOD! One small step for man, one giant leap for tinman kind," was Robonauts first tweet. Our technological friend will prove really useful when his space legs get him walking. Robonaut 2 was born on May 7th 2010 in his hometown Houston, Texas. Nasa plans to get Tinman souped up for spacewalks assisting his human colleagues during tedious and dangerous missions. Some of R2's extraordinary abilities include tweeting, multi-tasking with the ISS computer consoles, conducting mental and physical tasks using human dexterity to adjust things, performing precise repairs on satellites with the technological toughness to survive the vacuum of space. 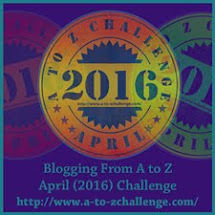 Will R2 exceed the sum of his programming? Here's my top 5 Star Trek favorites so I'd better stick to Science Officer Garratt's starship rules and regulations. Actually I may have steered off course a little, phaser me! I just had to mention Khan. Now to begin. 1. Spock our pointy eared vulchie speaks for himself. "I am an accomplished Scientist devoted to logic..." says Spock to Captain Kirk and Dr. McCoy. So what does that make Dr McCoy? He's a man of science too, highly respected and as of 2267, earning the Legion of Honour duly decorated by Starfleet surgeons. Spock is well known for his statements of logic and analytical prowess which he shamelessly preaches in front of Dr McCoy. Is Mr Spock having fun at the doctors expense? Or maybe Spock's human/half is having an emotional outburst? 2. 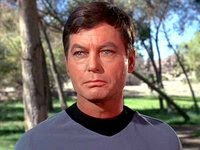 Dr Leonard H. McCoy is USS Enterprise NCC 1701 chief medical officer. McCoy is a country doctor from Georgia, called 'Bones" by his friends who enjoys the odd sip of Saurian brandy between patients and hates using transporters! You can't help but like the old coot and identify with the good doctors frailties. "In a pigs eye!" 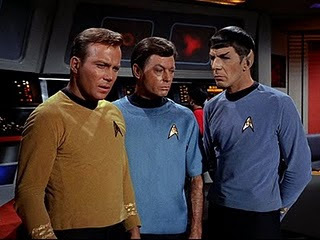 stirs McCoy, hoping for an emotional outburst from Spock's human half which he usually gets. When these two are at each others throats, with Kirk as referee, its usually highly amusing to see whos going to win which is why I'm giving them the top two slots. "That is a human emotion " replies Spock cleverly. "You bet your pointed ears, it is!" wisecracks Bones. The camera swings around to Spock and we see his famous arched eyebrow raised and a look of pure astonishment etched all over his face. Spock, you haven't changed a bit. You're just as warm and sociable as ever. Nor have you, doctor, as your continued predilection for irrelevancy demonstrates. Your a lost space explorer...Your aboard the starship Voyager.Heres a crew severed from Starfleet, from family and friends feeling their own loneliness and lost in space. When you look out a porthole and see the stars whizzing by you feel a weird hungering sickness calling you home. Its because these Delta quadrant stars are alien to you. One person keeps your dreams intact with the hope of ever getting back to planet earth in one piece. Good old captain Janeway. You believe in her effective leadership to see things through to the end. In Voyager's two-part 'Year of hell' Janeway becomes entangled in a sinister time-altering plot. A Krenim temporal timeship commander, Annorax has gone quietly insane over the death of his lost love. Giving up just isn't an option for Janeway who propels her battered ship into the face of certain death. Kate Mulgrew is great at Star Trek Conventions. "Captain Kathryn Janeway: How do you plan to implement this protocol, Doctor? Mr. Tuvok doesn't have a security team, both the brigs have been destroyed, and with the internal force fields offline, you'll have a hell of a time keeping me confined. You'd better grab a phaser; because before I give up command, you'll have to shoot me." My 4th Star Trek favorite is Commander Data of the U.S.S. Enterprise NCC 1701-D who plays the chief operations officer in Star Trek TNG. Our metal friend is a sentient android comprised of sophisticated neural nets and heuristic algorithms which makes him really special. In other words hes more than just a walking, talking machine, Data is a brilliant cybernetic creation with only one flaw, hes devoid of emotions... lets hear it now, awww. What do I love about this character? 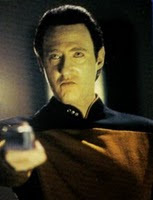 Data keeps trying to emulate humans and their behaviour despite countless setbacks.. "I will never exceed the sum of my programming, will you help me Geordi?" This tough android has amazing diagnostic abilities and can beat Klingons and Borg in a hands down scrap any place, any where. Oh yeah baby and its a hoot to hear Data's precise calculations annoying Picard, who more or less tells him to shut up. Last but not least is 5. Klingon warrior Worf the real dark horse and tough guy. (Lwaxana Troi - Majel Barrett teased him once by calling him Mr Wolf. She had a happy talent for making people smile with her lovely light hearted humor). Worf enjoys reading Kahless the Unforgettable and drinking prune juice which he called a warriors drink!!! The klingon is tolerant of humans, honour bound to Klingon tradition, easily aggravated by Datas questions and loves engaging worthy opponents and battering them blue with his bat'leth. 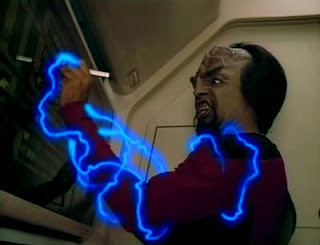 On stardate 47653.2 (2370) in the episode "Genesis" TNG (7th season) Mr Worf devolved into a merciless lower lifeform with a very bad temper and intense dislike for doors. Worfs the man to have on your side if you've got spooks to chase up. Remember how Worf gave our brave captain, Jean Luc Picard the worst shock of his life turning him into a scaredy cat. My guess is the captain wasn't the only one terrorized out of his wits. Right? Gates Mc Fadden (Dr Beverly Crusher) did a brilliant job directing. We have discovered a new resource in a far corner of the alpha quadrant of the World Wide Web. We have been ordered by Starfleet to investigate this unknown entity, familiarize ourselves with it, and bring back useful information for further study. 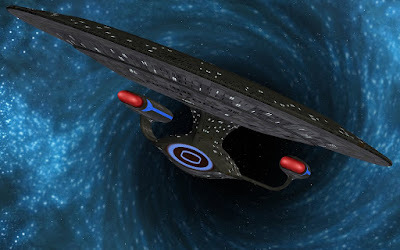 For the purpose of your trek research Star Trek Sci Fi Blog has improved its search parameters, to boldly go and seek out new lifeforms and civilisations. Obey the Prime Directive at all times and enjoy the privileges and immunities afforded you within the galactic Star Trek Tabs of our fun resource. Engage! There seems to be two distinct entities – Star Trek Television Shows and Episodes and Star Trek Movies. These two new resources from FindTheBest are great for all Star Trek enthusiasts out there who simply want to immerse themselves deeper into the world of Star Trek. Star Trek Television Shows and Episodes Comparison is an objective interactive resource that allows fans to sort and filter their favorite trek. All you have to do is enter whatever excites you about the television world of Star Trek. For instance, if you thought the best Star Trek episodes were when James T. Kirk was captain, simply filter by entering James T. Kirk using the “Captain” filter. Your search results will yield Star Trek: The Original Series and Star Trek: The Animated Seriesfor your ultimate gratification. Or maybe you were in a heated debate about who was a better captain for the U.S.S. Enterprise: James T. Kirk or Jean-Luc Picard. Using the Star Trek Television comparison you could compare Captain Kirk vs. Captain Picard and settle the mystery once and for all. Furthermore, Star Trek Television comparison allows you to sort and filter by number of seasons each series lasted, total number of episodes, years the shows were on air, and even the running length of an average episode. It’s truly a fun, interactive, and most importantly helpful utility for all Trekkies and Trekkers out there but see for yourself. FTB has a Star Trek Movies Comparison that, much like the Star Trek Television Shows and Episodes Comparison, allows fans to sort and filter your favorite TV shows, character or movie preferences. Simply engage the Star Trek television comparison and input your data or use the movies comparison tool for settling interstellar disagreements . Don’t let Qfool you, by using the inflation adjusted “box office revenue” filter you could objectively argue that J.J. Abrams Star Trekwas the best based on the fact that it earned the most revenue; with Robert Wise’s Star Trek: The Motion Picturegenerating enough cash to fuel a score of Star Trek spin offs and movies. What great lines from your favorite Star Trek Movies or TV Shows do you like to reminisce over? Star Trek movies comparison includes memorable quotes from each movie: Star Trek (2009): Young Kirk: My name is James Tiberius Kirk!. Star Trek Movies and Star Trek Television Shows and Episodes Comparisons were designed by a Trekkie for a Trekkie. It was built as a utility to explore strange new film and TV comparisons and to seek out new Trekkie's. FindTheBest’s Star Trek comparisons will boldly take you on a voyage of discovery. 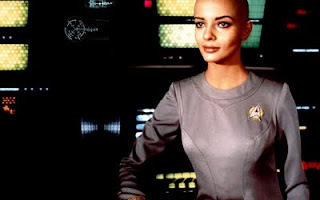 Use the galactic diagnostics at Star Trek Sci Fi Blog to help ease your trek cravings for the galaxies greatest space epics. I like to embrace the cosmic components flowing from our universe lurking everywhere around us. The positive energy radiating from these space bugs got me hooked on Star Trek when I was a wee lad. Is it an affliction or an addiction? - Live Long and Prosper, Trekkies. I tuned in for Star Trek's Mr Spock and up flew the LLAP hands at the end. They were fast weren't they? Heres Leonard Nimoy saying Thank you to fans as he bids fond farewells at his last Star Trek Convention in Vegas. 'It took years of diligent practise and self denial' for the great vulcan to master the vulcan salute. I love that line. After Star Trek ended in 1969, Nimoy joined Mission Impossible and played the mysterious Paris character and resident master of disguise. Nevertheless our pointy eared alien Mr Spock just refused to go quietly. In the late 1970's Star Trek re-runs were an immediate hit with trek fans who never gave up on Star Trek TOS. Spock was back claiming he had no emotions and yet the vulcan struggled with his human half. Its fun watching Spock dictating logic towards his Enterprise crewmates supplying us with great laughs every time. Its probably why the show survived. Sadly for Spock though, the vulcan disciplines of Kolinahrfail to control the suppressed, human half trying to escape. Star Trek just wouldn't be the same without Spock's radical philosophies challenging the human logic of his Enterprising crewmates. The shows catch phrases, wonderful aliens and light humor are great for the human soul. I suspect part of the human condition wants to be seduced by bewitching aliens, truth and knowledge but maybe like Spock our trekkie blood burns constantly with fire? Creation Entertainment's Official TREK Convention celebrates the 45th Anniversary of Star Trek this week for four days, hitting it off this Thursday on August 11th to 14th, 2011. 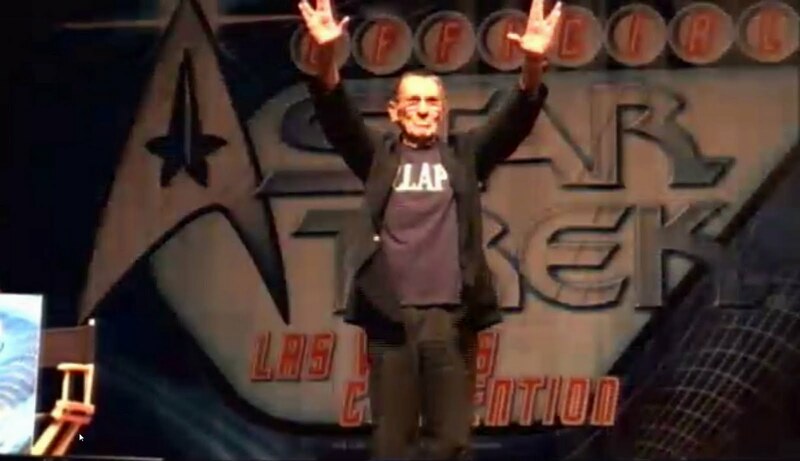 Star Trek fans should know its Leonard Nimoy's last Las Vegas appearance. Will you be there? Its all happening at the Rio Suites Hotel which Creation Entertainment promises will be a non stop superstar party. You can count on seeing 70 celebrity guest stars, Leonard Nimoy and the three Captains with William Shatner/Stewart/Mulgrew live on stage. This event will be a fun filled sci-fi roller coaster for fully fledged trekkers, trekkies and fans beaming in from all over the universe. The famous costume competition is going to be great fun. Its an attempt to win back the world's record of most Star Trek costumes in one place. The Rio convention will deploy the Sulu Summit, exciting panels, exclusive presentations, giant vendors rooms, musical and theatrical performances, autographs and photo opportunities to meet your heroes, auctions and trivia games, the filming of a new TV special on the convention floor, and food functions for hungry trekkies to keep our thrusters fired up for the whole day. 4 Klingon warriors representing the Empire will appear together on stage. Will these guys impress us with Klingon swear words? In any event I'm looking forward to the deep ridged foreheads, spikey teeth and usual warrior gags honoring strength, combat and ritual. 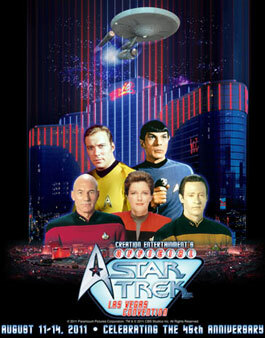 Star Trek Vegas tickets are still available at the door. I took the Trekkie Test over the weekend at nerdtest.com and its official. I'm a Trekkie. Actually I've got Alex Cavanaugh to thank for encouraging me on. Spacerguy, you are a dedicated Trek geek! But seriously it seems to me theres much controversy about Trekker and Trekkie perception. What defining qualities really distinguish us from one another? Do you agree with this list? Could it be trekkers are actually more socially sophisticated than Trekkies? or is it something else? The great debate about trekkie vs trekker rages across the Internet so I added my own two cents Trekkie or Trekker to peek your curiosity. Warp over to Nerd Tests and take the Trekkie Test! I guarantee you'll get a warm trekkie feeling afterwards! Granted you may not make it into the top 3 percent but its still good bit of fun testing yourself. Chris Pine is a Techie Trekkie! Have you got what it takes to get into the Admiralty? LOL It's interesting but the only Trekker Test I could find on Google is a little quiz written by me! Yes its true, we're not misfits, trekkies do have girlfriends and not all of us live in our parents basements either. So who invented the word Trekkie? Apparently Gene Roddenberry did. The father of Star Trek is quoted as saying he invented 'Trekkies' although I can't find any written confirmation of this which is a real pity. If anyone can find it please send it in to Star Trek Sci Fi blog. Now speaking of connotations William Shatners Saturday Night Live didn't help matters any by taking the complete rip out of Trekkies but what a skit! To conclude, I've been ranked as a complete nerd, worthy of the rank Captain. So what does this mean? You are a Trekkie, through and through! You know the series, the movies, the literature, the science, and you are proud of it! You are probably saving up to buy your own starship! You are part of a vast community of Trekkies, and you're loving it! Congratulations! The average Raw Score out of 28532 unique test takers... for Trekkiness is: 104.3, but mine was: 150. Whos the best? 3% scored higher, and 96% scored lower. So what are you waiting for? I took the plunge and it was totally fun. Test Long and prosper, Trekkies, Trekkers and Niners! Remember Captain Kirk's opening monologue from Star Trek's classic series ending with 'to boldly go where no man has gone before?' After enjoying the Writing Ninja's Alex Cavanaugh's 'Making Connections' post I wanted to join in on the fun with some classic trek geekery of my own. Blogging: the final frontier. These are the treks of spacerguy. 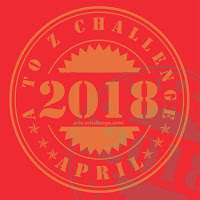 His ongoing quest: to explore strange, new blogs, to seek out new bloggers and reach uber enlightenment, to boldly go where no blogger trekkie has gone before. Thanks for spurring me on with your cosmic humour, Alex. So what are the good vibrations associated with being recognized as a dedicated Trek geek? Theres one good way to find out. I'm taking the Trekkie test and I urge you guys to take the plunge with me! Live Long and Prosper, Trek Geeks! Heres a shot of the recreation-deck in Star Trek The Motion Picture which allows us to appreciate the entire crew of the starship Enterprise. Captain Kirk's been promoted to Admiral and hes the dude delivering the wonderful news about the bitter energy cloud on a direct collision heading with Earth. Scary stuff eh? Why did I join Kirk's ship? Just look at those haunted faces staring at the Epsilon IX Station battling V'ger's wrath. Hey, we won't judge you for tucking tail and abandoning the Enterprise during Earth's hour of need, explains the Admiral pulling a blinder. So the USS Enterprise NCC 1701 crew swallow their fears despite seeing their Klingons buddies biting the dust. Why be afraid? V'Ger only intends to deactivate Earths 'carbon based units' unless they yield the creator, "The Kirk Unit." who built Voyager One. The strange, sentient, cloudlike creature/machine thing is a technologically enhanced ancient earth probe measuring two AU's across! Sounds seriously meaningful doesn't it? So I looked it up. The V'ger cloud is 200 million miles across big but get this, V'ger is lonely and wants to experience some simple human feelings by joining with the creator. How sweet is that? I feel so emotional right now. Amid the hundreds of Enterprise crew members staring up at the recreational deck viewer are about 150 fans and friends of the movie production. Their inclusion was the studios way of saying Thank You to the Fans for their valuable support of Star Trek over the years.